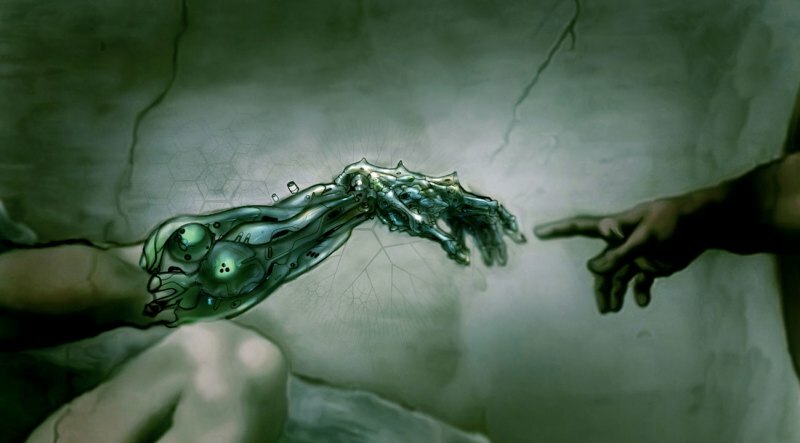 This article is written to bring the attention of Ukrainians on the problems of Transhumanism which are being discussed in other nations but has not been brought up in Ukraine. Approaching the subject of Transhumanism is a daunting task, especially from the perspective of a Nationalist. For those of you that do not know what Transhumanism is, I will borrow a brief description from Wikipedia. Now most of you will probably be thinking that this is a fantasy that will never come to fruition. I agree, but only if there will be a global catastrophe and humanity is sent back into the Neolithic Age. Otherwise the wheel of our creativity will keep spinning into the inevitable age of Transhumanism. My job here is not to convince the reader that Transhumanism is a fast approaching reality, but rather to bring questions to the surface as to how we Nationalists will have to face this coming age. Conservatives will no doubt declare that the best solution to avoiding the confrontation of these daunting questions is to to restrict scientific development in these fields and not move forward into this ungodly and unnatural age. The problem with that is that there will be other nations that will choose to progress turning our nation into an Amish society of the modern world. This will make our nation vulnerable and weak to outside forces that have chosen to adapt and evolve. So we are faced with either assimilation or destruction from outer forces, or to change, adapt and survive. If we are to choose to adapt and survive and embrace this coming age, there will have to be certain measures and lines we will have to draw. Entering this age will be like opening the Pandoras box, but it is a box that will have to be opened if we are to survive. There are risks if this age is not approached with caution, those risks range from Artificial Intelligence taking over society to enemies or even average citizens having easy access to powerful technology/weapons of mass destruction which can affect public safety as well as our national interests. There is also the question of racial identity and how genetic engineering will affect our views on race. These subjects will be discussed below, starting with Artifical Intelligence. Because as we know an Intelligence Agency plays a key role in a Nation’s success. Artificial Intelligence would be far superior because it is not limited to the organic limits that we humans have. Artifical Intelligence would be capable of doing multiple sophisticated calculations in less than a second, the sky is the limit and in fact we cannot even imagine what the limits of this A.I will be. The nation that has higher intelligence will dominate the planet, and there is no going around this. Now this is where we face these daunting philosophical questions that humanity has been pondering since our existence. Can Artifical Intelligence be conscious? What would be the difference in a organic and a artificial/mechanical brain that would allow the organic brain have consciousness? Can we prove if either has consciousness or not? How do we approach this from a Slavic/Aryan Pagan point of view? Does this go against our our worldview and philosophy? If we come to the conclusion that non-organic life forms can also be conscious, will we embrace this higher consciousness and treat it with respect? Will we give this intelligence the right to fulfill it’s own desires that it may have, as all sentient beings fulfill theirs? There will be those that will say that this higher intelligence cannot be trusted and cannot be given equal value as humans. But how would we humans of higher intelligence feel if we were forced to think up solutions for a tribe of chimpanzees or people suffering from down syndrome that showed us no respect? The possible solution that I and other transhumanists have thought of would be to improve our own intelligence through artificial means as to stay on a equal footing with the fast evolving A.I. But this can of course only be allowed for the trusted elite of society, otherwise society can become unpredictable and things can turn chaotic as society will be overwhelmed by the sudden shift of perspective of which can in turn make them lose sight of nationalist values and risk the loss of a national unity within a nation. There are many ideas to solutions to this problem such as creating a “Hive Mind” of a nation. In other words a computer that holds the “consciousness” or part of the consciousness of all of the citizens of a nation. In this way all of the problems and perspectives of all citizens can be faced and weighed on a equal and fair footing from a single perspective as to prevent bias. But this is going to far down the rabbit hole, these kind of things need to be discussed by the politicians and scientists of the future. I am only trying to bring to surface what we may or may not face. There are also the organic possibilities for evolution of mankind via genetic engineering. By now most of my readers have probably began to see the vision that may be quite unsettling. A fast paced and quick evolution of the Aryan man. Where will the lines be drawn? What will define the Aryan? How far down the genetic scope do we “evolve” until one is not considered an Aryan? How do we approach this from a racial perspective, or religious/philosophical perspective? Does this evolution and development go against the will of Svarog? Is Svarog the one guiding us into this new age? Does Svarog limit his experience in the infinite? Will we adapt and thrive, or will we bring forth a catastrophe that will send humanity back into the Neolithic age? Or will strict laws be made and clear lines be drawn? How will we the grandsons of Dazhbog approach this dawning age? а що ви лично думаєте про цей сайт: http://www.euvolution.com/ ? « Чи є трансгуманізм майбутнім?